There’s only one name that sticks in the memory following the World Championships in Melbourne and perhaps surprisingly it’s not Michael Phelps. Not even Laure Manaudou. Instead it’s a name that viewers and spectators were exposed to more often than any other. Yes, it’s Yakult the manufacturer of pro-biotic drinks and one of FINA’s key sponsors. Their red and white logo adorned the head of almost every competitor in the pool and FINA made sure that they would wear them, by forcing those with hats which didn’t comply wear special FINA branded hats and hence lose the opportunity to wear their national colours with pride; the only swimmers who escaped were those who didn’t wear a cap at all. Thankfully FINA stopped short of forcing the likes of Lazlo Cseh and David Davies to wear one. This creeping tide of commercialism began in earnest at the 2004 world short course Championship in Indianapolis, when swimmers were forced to wear stick on sponsor’s bibs for presentations. That has been extended to now include similar bibs for competitors in semi-finals and finals. While they may not be to everyone’s taste, in general it’s positive thing that sponsors are willing to put money into the sport and they need to get exposure in return. If nothing else it proves the popularity of the sport, but there have to be limits. When, as in this case, it makes it harder to tell who is who in a race it’s gone too far. that’s particularly valid in a sport which suffers at the hands of sports like track and field, because it’s hard to see the human behind the swim. 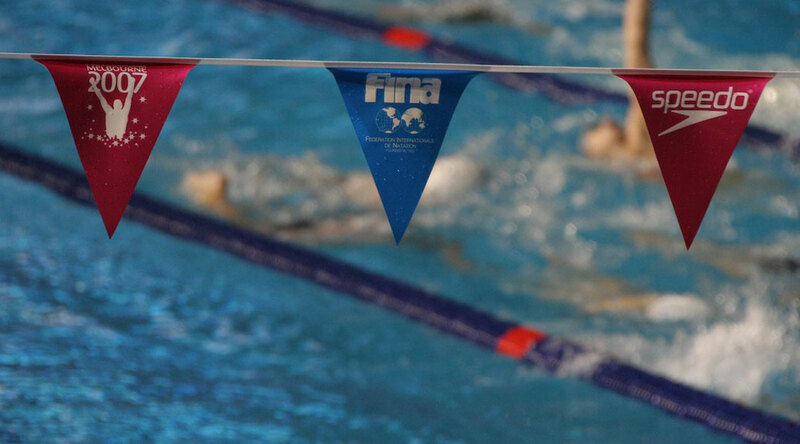 With lanes one to eight being homogenised into a uniform mass of branded hats, that situation is made worse and FINA needs to decide whether it puts a fast buck over the opportunity to help the long term growth in audience.